PARIS (AP)— The man who boarded a high-speed Amsterdam-to-Paris train with a Kalashnikov rifle before being tackled by passengers was on the radar of authorities in three countries, had ties to radical Islam and may have traveled to Syria, authorities said. El-Khazzani was being questioned Saturday by French counter-terrorism police who confirmed through fingerprints their suspicions that he was the same man who had been brought to their attention in February 2014, according to the French official. French authorities said he had lived in the southern Spanish city of Algeciras, frequenting a mosque which is under surveillance there. He was transferred Saturday morning to anti-terror police headquarters outside Paris and can be held for up to 96 hours. The Briton, businessman Chris Norman, said he was working on his computer when he heard a shot and glass breaking and saw a train worker running. Three Americans— U.S. Airman Spencer Stone and National Guardsman Alek Skarlatos from Roseburg, Oregon, and their friend, Anthony Sadler, a senior at Sacramento State University in California — heard glass breaking at the same time. French actor Jean-Hugues Anglade, who cut his finger it to the bone while activating the train's emergency alarm, heaped praise on the Americans, recounting the high emotion of the episode to Paris Match. 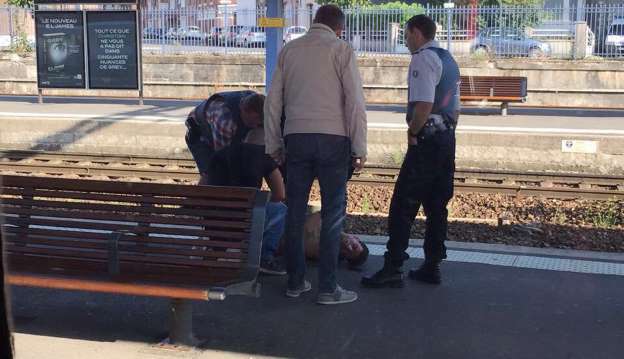 That victim, wounded in the chest, remained hospitalized in intensive care Sunday in "serious but stable" condition, and his life is not danger, according to Patrick Goldstein, head of the emergency service at CHRU Lille hospital. Achoui-Lesage reported from Lille. Associated Press Writer Maggy Donaldson in Lille and Greg Keller in Paris contributed to this report.